Environment Victoria put in an FoI request to the Victorian government in December. 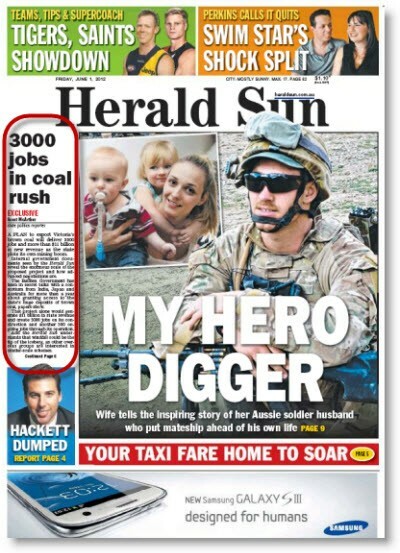 So why was it released to the Herald Sun the day the group was expected to finally received the FoI-ed documents? The future of a landmark social housing project lauded around the world remains under a cloud with the Victorian government refusing to commit to a new funding model amid a dip in homelessness funding in Tuesday's state budget. Former Victorian premier John Cain has condemned "political apparatchiks" for "trashing" freedom of information laws, one of the major reforms of his term in office. The lot of a Parliamentary staff member can be a tough one -- opening doors for insufferable MPs, hanging around until the wee hours while the state's finest minds debate some arcane piece of legislation and distracting nosy members of the media keen to get their mitts on embargoed Ombudsman's reports. From drugs to transport ticketing systems, policies, events, product developments, factories, new businesses and wars, many otherwise calculating political and corporate leaders become quite irrational when it comes to having to say enough is enough. You’ve got hand it to General Motors, the makers of Holden. Its success in garnering taxpayer dollars is breathtaking, writes Kath Walters, editor of LeadingCompany. Canberra says no to grazing — so what are states for? At least as the federal government sees things, the controversy over cattle grazing in Victoria's Alpine National Park is now over. Unemployment increased slightly in November, but the main impact was in Victoria and Queensland. The new Victorian government has systematically dismantled environmental protections and determinedly ignored its stewardship responsibilities to the environment, write Sandi Keane and David Donovan of Independent Australia. A network analysis of links between the principal voices involved in demonising wind farms in Australia has been circulating in recent weeks and reveals connections between some of the principal wind farm opponents.